The beginning of the school year can be a hectic time. Mindfulness is probably the last thing on your mind. Students are getting shuffled from one class to another, as a teacher, you don’t know your students’ names yet, and excitement builds to a fever pitch as old friends are reunited after the summer. But the first two weeks of school are not just a time to get through so that you can finally start teaching content. This is most important time of the year to set the tone for the culture of your classroom. By practicing these techniques during the first weeks of school, you can set up your classroom to be a mindful, compassionate, focused place. For this exercise, you’ll need a classroom set of transparent jars (plastic or glass), a few different types of glitter, and a water source. Have your students choose their favorite type of glitter and then fill up the jars with water. Then ask them to shake up the jars. Explain that these jars represent their minds. When the jars are shaken up, it’s hard to see clearly through them because all glitter is storming around inside. But, if the jars sit still and calm, the glitter settles to the bottom and they become much easier to see through. The same thing happens in your mind. When we sit still and calm our thoughts, it becomes much easier to see and think clearly. At this point, ask your students to find a comfortable position in their chairs, drop anything they’re holding, and close their eyes. Guide them through a breathing meditation by instructing them to focus on each inhalation and exhalation, really paying attention to how each breath feels, noticing any thoughts that come up, but maintaining focus on their breathing. Ask them to visualize the jar with the glitter settled at the bottom and explain that you’d like to start each class like this to help settle the glitter in all of their minds, including yours. For older students, I find that it’s helpful to involve the classroom in a discussion of the benefits of mindfulness to give them agency over its implementation into the classroom. Start with an article that explains the benefits of mindfulness, like this one. Give students time to read it through and answer questions to test their comprehension as well as why it might be useful for you to do it as a class. Lead a short discussion that focuses on how mindful breathing could benefit their community in particular. After your discussion, ask students to find a comfortable position, drop what they’re doing, and close their eyes. 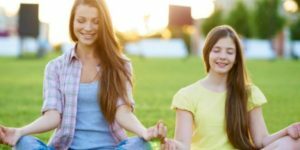 Guide them through a breathing meditation by instructing them to focus on each inhalation and exhalation, really paying attention to how each breath feels, noticing any thoughts that come up, but maintaining focus on their breathing. After a few minutes, ask students to share how they felt. I like to do this with each class for three minutes at the start of every period for a week and then offer them the opportunity to vote at the end of the week on whether they’d like to keep doing it for the rest of the year. This makes it something that you’ve all decided to do as a class, not something that you make them do each day. I’ve never had a class vote not to do it. This can be a really fun way to introduce the concept of mindfulness to kids of any age. Ask students to turn on their ‘spidey senses’ when picking up the bubbles, opening the bottle, smelling the soapy mixture, inhaling, exhaling, and watching the bubbles float until they pop. 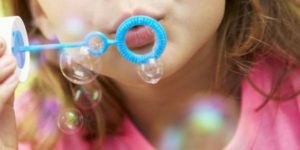 I recommend doing this activity outside, so that every student can find a quiet, personal space to mindfully blow bubbles. These are just a few activities. If you’d like to learn more about incorporating mindfulness into your classroom or school, check out our free ebook Teaching the Whole Class.